In Wall Street, the Dow jumped 0.9% or 107 points to 11362, the 2nd straight day with assurances of support from the European Central Bank helping ease investor concerns over the region’s debt while upbeat U.S. reports on chain stores sales and October pending home sales lifted investor optimism. Sentiment was also boosted by Spain’s PM statement that it does not intend to tap the European Union fund. These reports overshadowed a slightly worse than expected report on jobless claims and worries about the geopolitical tensions in Korean peninsula. crisis are envisaged to temper the geopolitical risks concern in Korean peninsula temporary, provided no further military intrusions happen. Investors’ sentiment turn firmer amid easing market's uncertainties and this has encouraged rising appetite for equities, especially on key blue chip stocks and lower liners. 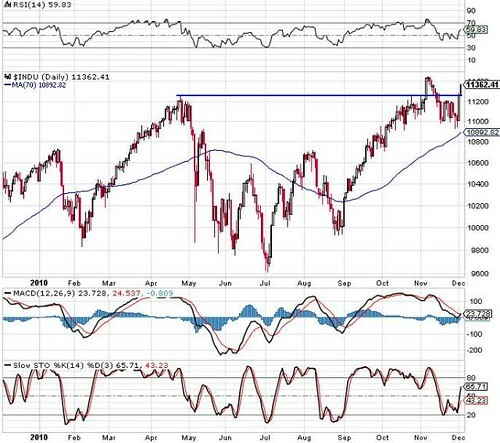 Daily Dow Jones is likely to retest the year-to-date high of around 11500 zones amid a positive breakout above the overhead resistance and improving technical readings.